Does your dog have a drop it command? If not, first teach him to drop things out of his mouth by placing a treat over his nose when he has a boring toy in his mouth and say “drop it” as he opens his mouth to take the food. Praise him and give him the toy back. As he gets better and better at this, begin having him drop more valuable items out of his mouth, like his chew bones. Start the game off by commanding the dog to sit! Play for a little while, and then ask for a “drop it.” The dog should have a bomb-proof drop it and should release the toy immediately. If the dog doesn’t release it, just hold onto the toy and don’t pull on it or look at her. She’ll realize that “well… this is boring” and then should release the toy. Praise her for the release, but put the toy away. You can re-start the game in about 5 minutes or so (this serves as a time-out for her ignoring the drop it command. Play again, and then ask for a drop it. If she drops it, praise her and give her the toy immediately with a take it command. It’s recommended that once in awhile, after commanding her to drop it, that you do a couple of obedience maneuvers before re-starting the game. 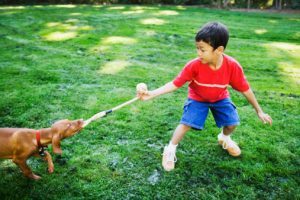 Whatever toy you choose for playing tug should always be put away and out of the dog’s reach. Remember that it is your toy, as are all others. Put the toy away until YOU decide when to bring it out again. If the dog makes any mistakes, like touching your skin with her teeth, the game ends immediately, the toy gets put away, and she gets ignored for about 3 minutes or so. Wait several hours after a mistake like that before re-starting the game. Then, put the toy away. This entry was posted in Training Tips on May 30, 2015 by renee.